Just in time for holiday Christmas tree decorating, we wanted to introduce a new product, Tinsel Ties, that will make your holiday decorating easier. More than just a cute name, Tinsel Ties will save you both time and money on Christmas crafting and decorating. We can all use more of both those things during the hectic holidays! 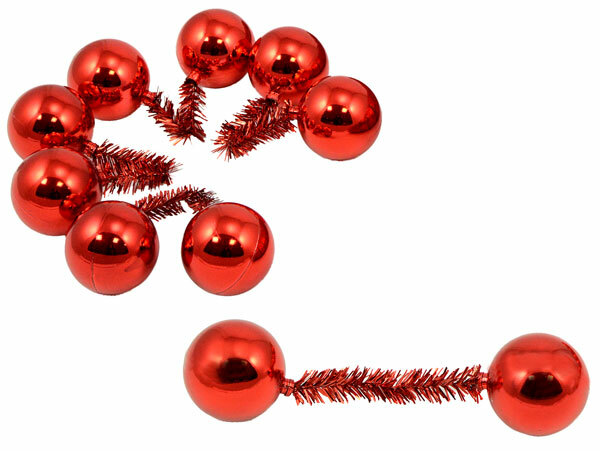 Tinsel Ball Ties are a pair of metallic ball ornaments attached on each end to a wire tinsel tie. Sold in sets of 12 ties, they come in an assortment of sizes and colors. See all of the styles available here. 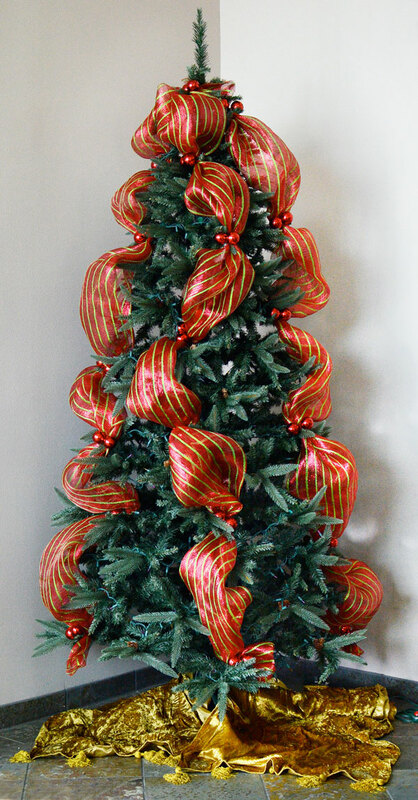 Quickly add deco mesh or ribbon accents to your Christmas tree with tinsel ball ties. The wire ties easily wrap around branches to hold additional accents like Poly Deco Mesh, ribbon or burlap in place. The sparkly ball ornaments add another festive layer. The tutorial below shows you how to use these tinsel ball ties to easily decorate your Christmas tree with deco mesh and ribbon. Here are some more decorating ideas with Tinsel Ball Ties. 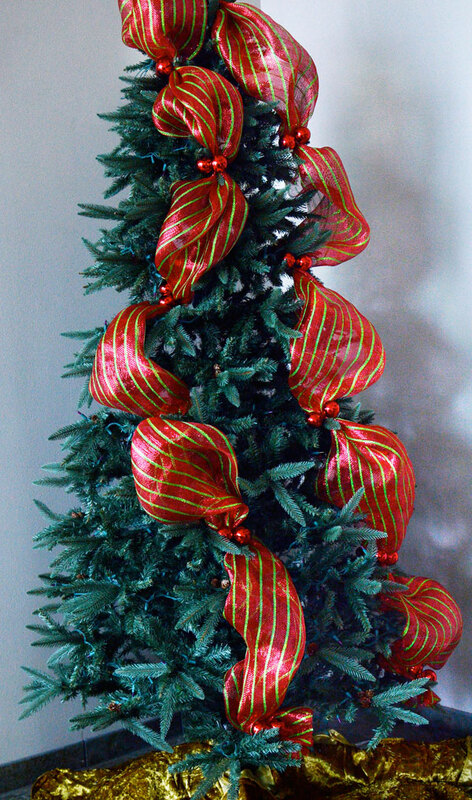 The flexible wire tinsel ties make it easy to add ball ornaments to indoor or outdoor trees, garland and wreaths. 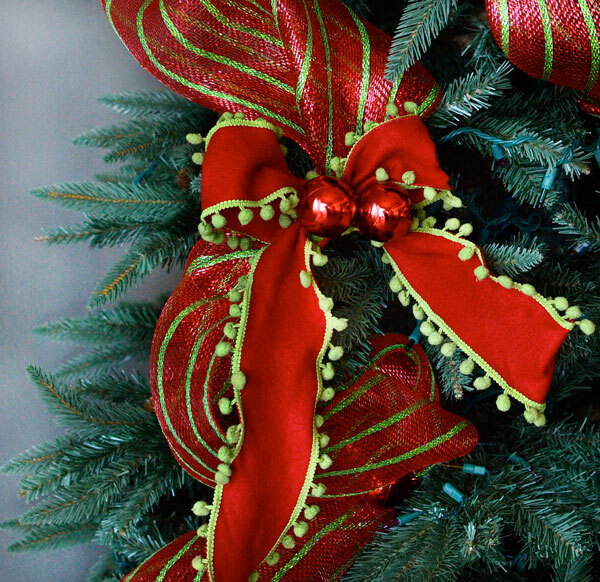 Here we quickly added Tinsel Ball Ties onto a fresh 24" Frasier fir wreath. 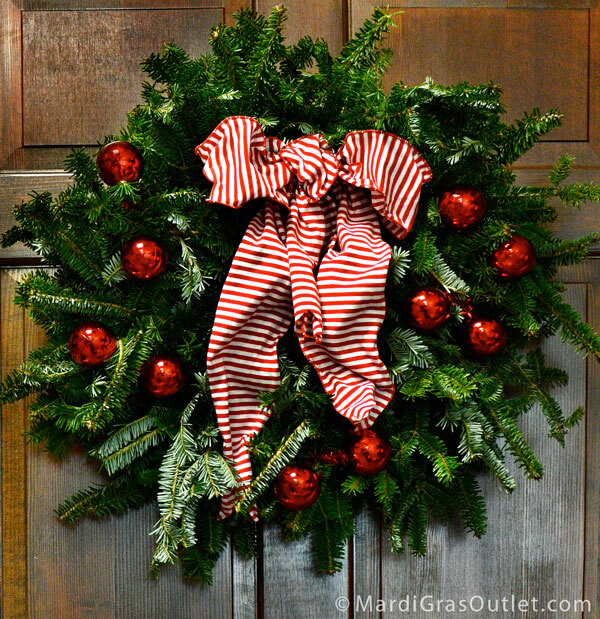 Along with a simple red and white ribbon bow, the tinsel ties transformed a plain wreath into a precious holiday door decoration in minutes. 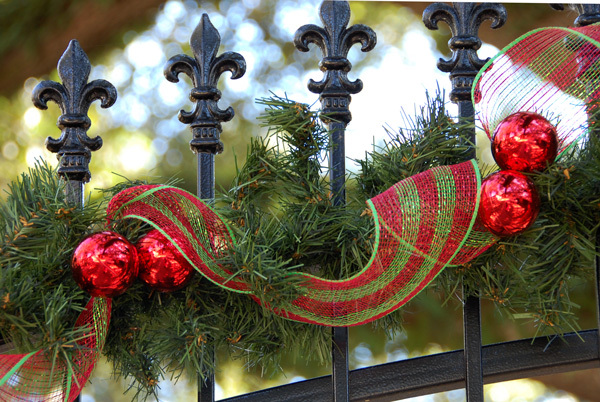 Ideal for outdoor decorating because they are both water resistant and shatterproof, we used tinsel ball ties to decorate an iron entry gate for a festive Christmas welcome. 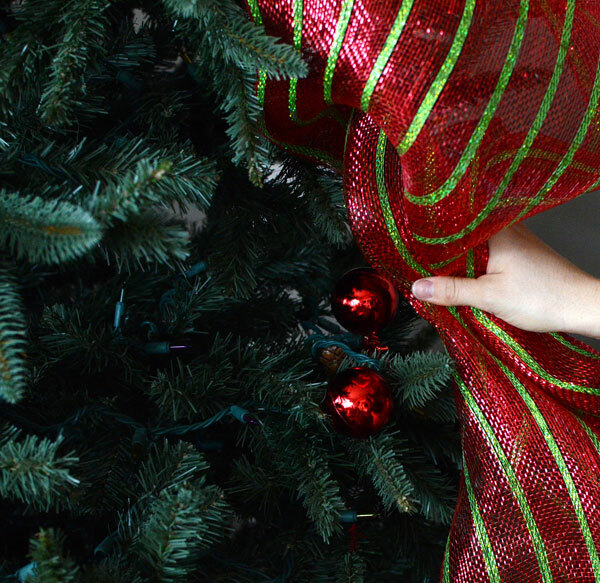 No worries of droopy, wet ribbon or shattered ornaments. 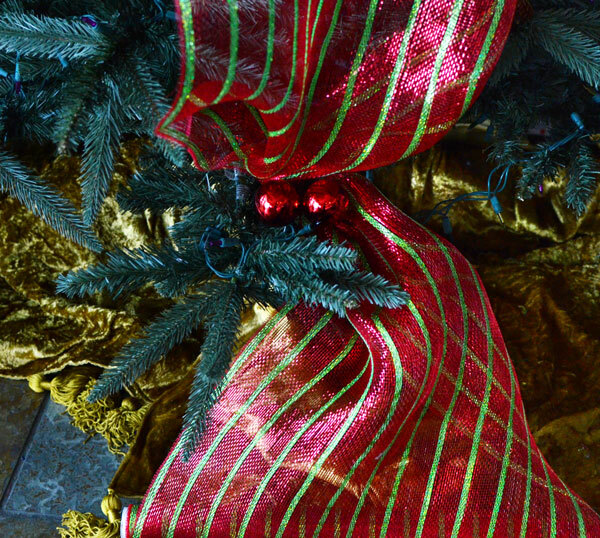 Add coordinating bows and ornaments at one time with the tinsel ball ties. 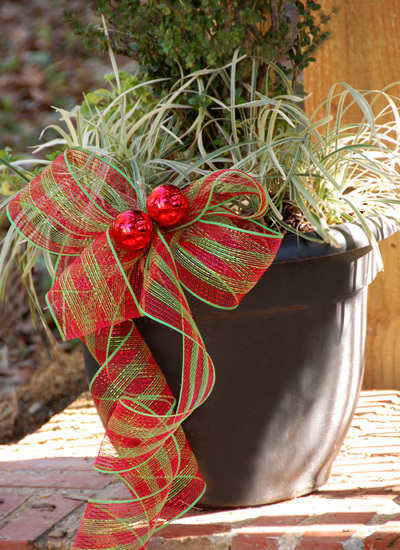 Use the wire ball tie to make the bow and wire it onto planter. To purchase these products from www.craftoutlet.com, click on the individual product link below. These supplies decorated our 8 foot tree with about a half roll of deco mesh left over. 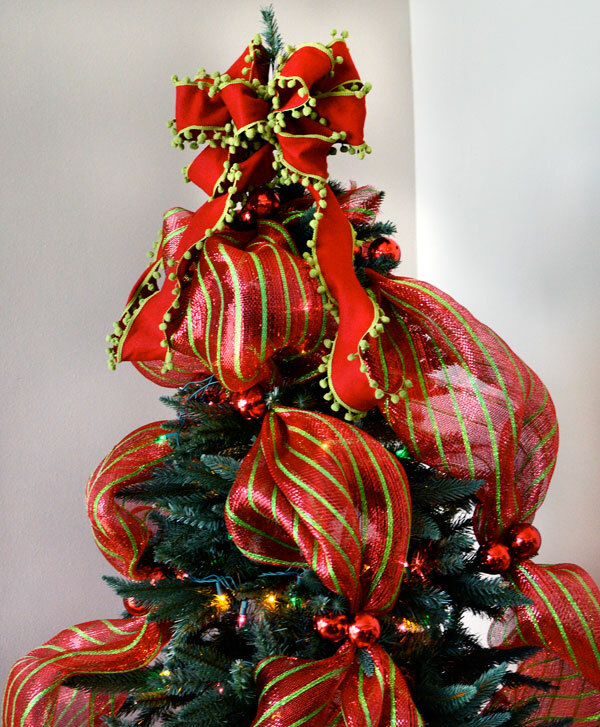 Depending on the size of your tree, you may need more or less deco mesh and Tinsel Ball Ties. 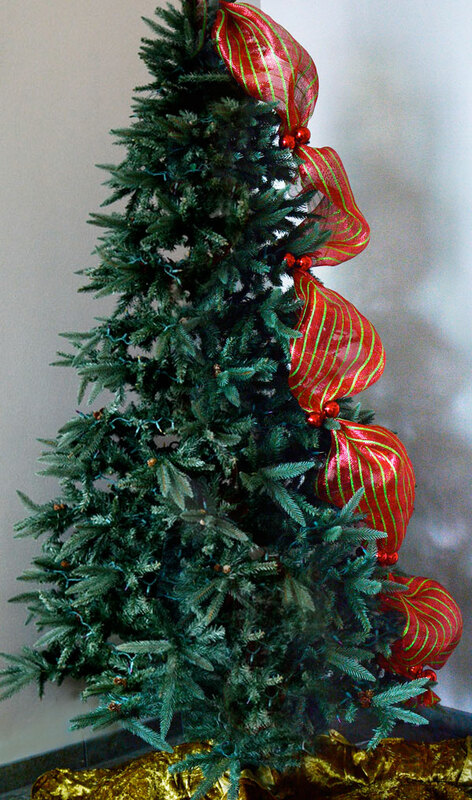 Attaching Tinsel Ball Ties and Deco Mesh to a Christmas tree is Simple! Gather the Mesh with both hands from each side. Try not to bunch it. Place a Tinsel Ball Tie behind the Mesh and under one of the branches. Twist the balls around each securing the mesh to the branch. 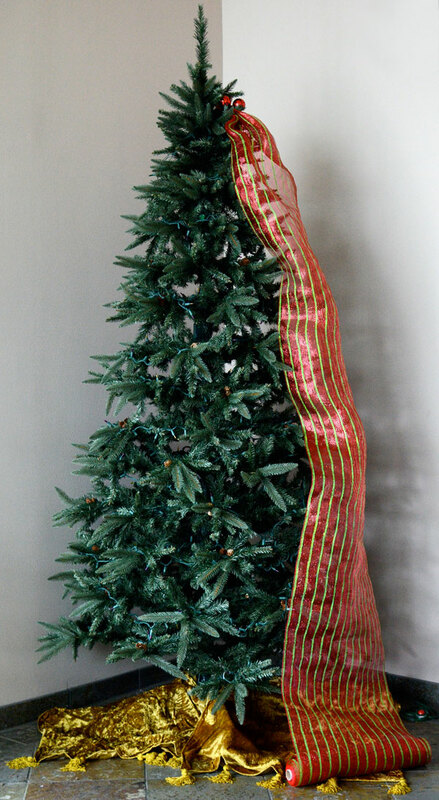 Attach striped Deco Mesh with a Tinsel Tie near the top of the tree and let the roll of mesh unfurl to the ground. Step 2: Move down the Tree. As you move down the tree vertically, use the tinsel ball ties to attach the mesh to the branches. Leave at least a foot of space between each tie, to achieve the look you desire. 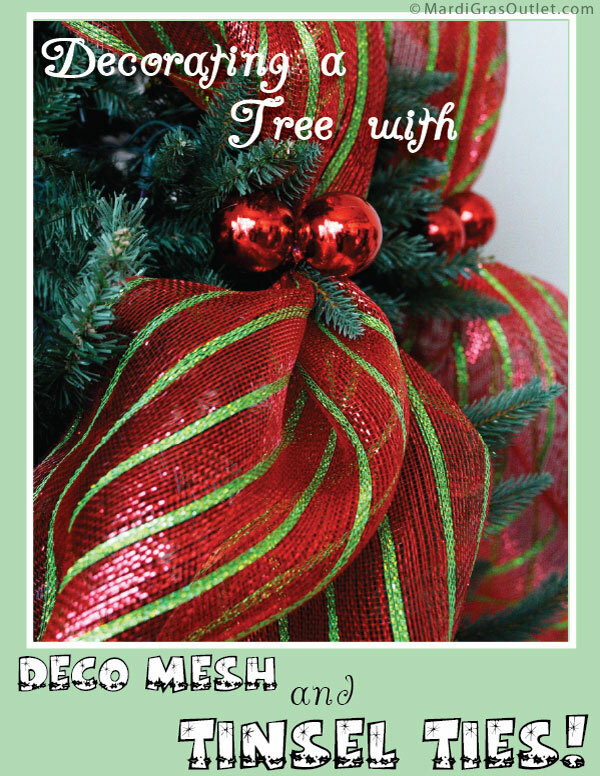 Do not pull the mesh tight, but allow it to fall loosely between ties, this will give the tree volume and texture. When you've reached the bottom of the tree, (we used about 7 ties on an 8 foot tree), twist the deco mesh into a Tinsel Tie to secure. 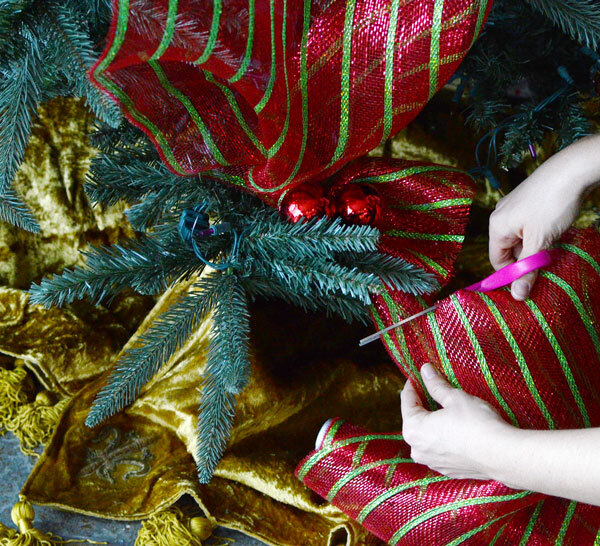 At the bottom, trim the deco mesh with scissors once you have attached it securely into a Tinsel Ball Tie. Continue steps 1-4 as many times as it takes to fill in your tree. We made three vertical panels of Deco Mesh on the front of the tree (with mesh left over). Depending on the height of your tree, with 2 rolls of Mesh you could create 4 or 5 hanging sections, or spiral the deco mesh around the whole tree from top to bottom. Allow the mesh to fall naturally downwards, create zig-zag patterns down the tree, or make slight curves with the deco mesh. Rearranging the placement is easy with Tinsel Ties, and they won't poke skin or grab sweaters like floral wire. 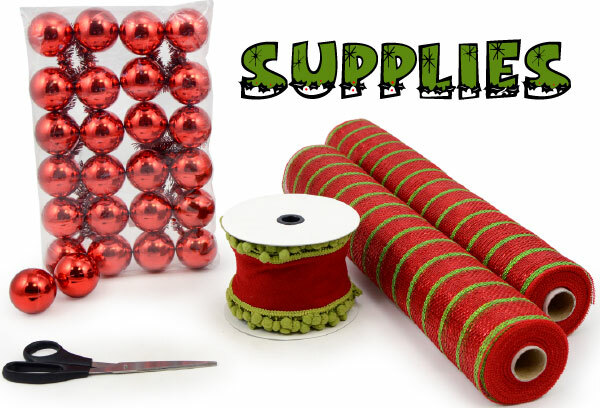 At any point, you can untwist the Tinsel Ball Tie to add in bows, floral sprays, ornaments, or ribbon. This precious vintage looking pom-pom ribbon bow is easily added onto the tree by placing two loops to form a bow into the tinsel wire tie. Add a bow as a tree topper! For directions on making a bow, see the tutorial on this blog post. Our tree decorated with deco mesh garland and tinsel tie balls. We hope your tree turns out just like you imagine! Merry Christmas!